Nate has a lifelong history with martial arts. As a child, he started out with Karate classes, changing over to Taekwondo as a young adult. 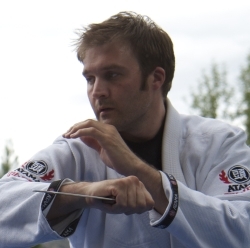 After some basic instruction in arts such as Iaido and Aikido, he found his true passion in Danzan Ryu Jujitsu and began training in 2008 with Sensei Dan Browning. Nate currently holds the rank of Sandan (3rd degree) in the AJJF. In the tradition of the DZR founder, Seshiro Okazaki, Nate earned his Bodywork Technician Certificate in Danzan Ryu Restorative Therapy from the Danzan Ryu Seifukujitsu Institute in 2011. He enjoys giving back to his students and friends by providing restoration treatments. Nate demonstrated his dedication and commitment by taking on the role of Head Instructor for Shinzen Kai in 2013. He continues the tradition of providing high quality instruction to all comers in a friendly and safe environment.